Horseshoe Valley is one of the most popular skiing destinations in Ontario. But if you have a hotel that’s full all winter and empty all summer, what do you do? Easy – you set up some stuff to do in the summer, and that’s what the Horseshoe Valley people decided to do. 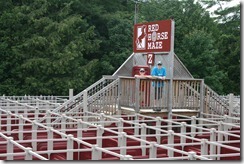 They created Horseshoe Adventure Park and gave people a reason to come out in the summer as well. Last week, we spent my birthday there and had a fantastic day, even if the original reason we were going was not even available. A few years ago, we started a new Christmas tradition. Each of the four of us would come up with something that we wanted to do (some sort of outing), and make up a poster about it. Then after Christmas, we’d schedule these outings throughout the year. The only rules were that it had to be less than $200 (or at least close), and it had to be close enough to make it a day trip. The first year we went snowboarding, to an aquarium in Niagara Falls, and canoeing on the Grand River near Paris. (We only did three because Gail and I coincidentally both chose canoeing.) Since then we’ve been to another aquarium, the HMCS Haida in Hamilton, a butterfly conservatory, and skating at Nathan Phillips Square. This past Christmas, Nicky’s poster was for Horseshoe Adventure Park, which had a thing called Aqua Ogo which he was dying to do. In a nutshell, the Aqua Ogo is a big rubber ball with water in it. Two people get in the ball and then you are pushed down a hill. Here’s a video of Rick Mercer at the park riding motorbikes (which I don’t remember seeing) and the Aqua Ogo. Nicky thought this would be the greatest thing ever (and it does look like fun) and so we planned on going sometime over the summer. When Gail found a WagJag coupon to get us in at half-price, that made it even better. We ended up going on my birthday just because it was a convenient day rather than a birthday present for me. But a couple of weeks before we went, Gail got an email from WagJag saying that the Aqua Ogo (which was included in the package we bought) had been shut down until further notice. No further details were given, but we assumed that someone had gotten injured and the ride was shut down until (a) any pending lawsuits were settled, and/or (b) the safety of the ride was improved. Nicky was pretty disappointed, but we decided to go to the park anyway. 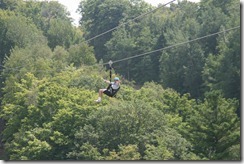 The other major attraction was the zip line, billed as the fastest in Ontario. This was a blast. I’m not always Mr. Thrill Seeker, in that I’m too chicken nervous to bungee jump or skydive or things like that (I don’t even do tall roller coasters), and I have to admit I was a little concerned at the top of the tower that I would be terrified the whole way down. Some people find being terrified exhilarating. Not me. But no more than a few feet down the line, I realized that this was going to be fun. It went fast enough to make it fun but not so fast that I felt out of control – not that there were any brakes or any way to get control should I have needed to. Nicky and I went at the same time and as I pointed out to him at the end, I totally dusted him – without even trying. (Thanks, gravity.) Gail’s as much of a thrill seeker as I am, but she loved it as well. And thanks to the closure of the Aqua Ogo, three of us got to go a second time. After the zip line, we wanted to try another thing called Treetop Trekking, which was basically a high ropes course through the trees. This looked fun as well, but after we filled in the waiver forms we found that reservations were strongly recommended, and we didn’t have one. Since they were fully booked for the rest of the day, we were out of luck. We had no idea that we needed to make reservations so we missed out entirely on this part of the park. 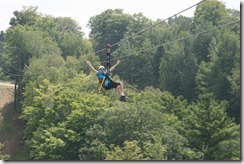 Dear WagJag / Horseshoe Valley: you really should add that into the description of the attraction. The Horseshoe web site makes that clear, but the WagJag thing did not. But this place had even more to do. 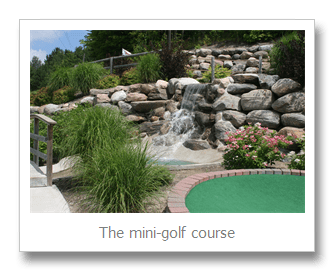 There is a beautiful mini golf course built into the side of a hill. It was well-designed and well-built and had nice waterfalls and wooden fences and gardens throughout. There is a big rock-climbing wall though the boys didn’t have a chance to try it. 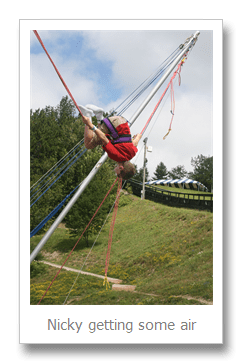 There’s a “Euro Bungy” thing, with trampolines and bungee cords that bounce you 10+ feet in the air. There’s a big maze which is fairly easy once you figure out the secret (both boys timed themselves getting through it after they figured it out – 50 seconds for Ryan, 49 seconds for Nicky) but until then, it’s tougher than it looks and a lot of fun. 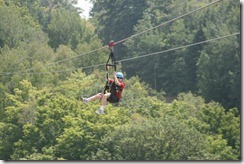 I mentioned earlier that three of us got to do the zip line twice. We each got a ticket as part of our package deal, and because the Aqua Ogo was closed, we all got the option of either a second zip line ticket or a “mining” bag, which was a bag of dirt containing small gem stones. 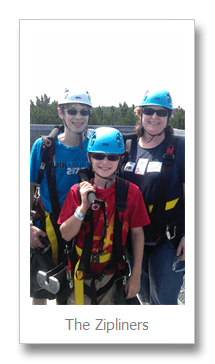 Gail wasn’t sure she was going to want to go on the zip line twice and Nicky loves to collect rocks so Gail chose the dirt (and then Nicky walked around all day paraphrasing Captain Jack Sparrow – “I’ve got a bag o’ dirt!”). Turned out that she enjoyed the zip line enough that she could have gone again, but we had some fun using a sluice to filter out the rocks from the dirt and got a little collection of chunks of topaz, amethyst, and obsidian. 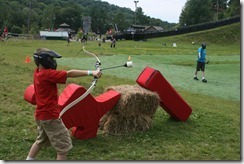 The last thing we did before we had to leave was Archery Tag, which is just what it sounds like. You get a bow and some arrows, and you try to hit other people to knock them out of the game. This sounds like just about the least safe activity you can imagine, but everyone is wearing a helmet with a full face mask, and the arrows have a big cushiony thing at the point that looks like a marshmallow. This not only cushions the impact so it doesn’t hurt but it slows the arrow down significantly – enough that Ryan was able to catch one out of the air. For a while it was just me against Nicky and Ryan (with photographer Gail covering from the sidelines), and then another family joined so it was the three of us against the four of them. They were clearly more skilled at this sport than we were, since I was knocked out less than a minute into the game, and by the time the game had ended, they had knocked Nicky and finally Ryan out as well while we took out none of them. 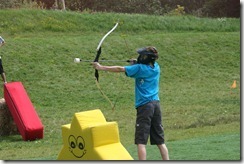 This was also a lot of fun, though I felt a little weird shooting arrows at my kids. This isn’t the cheapest place around, but it’s not outrageous either. The package we bought would have cost us $25 each plus another $45 for three extra zip line rides. The WagJag was about $50 for the four of us and that included the extra zip line rides (and the bag o’ dirt) because of the Aqua Ogo closure. There was your standard snack bar / chip wagon, and I believe there’s a full restaurant in the hotel though we never went in there. There was even a big pavilion for some shade and lots of picnic tables around. We had a ton of fun and Gail will be scouring WagJag for a similar deal so we can go back next summer. Truth be told, we had enough fun that we’ll probably go even if we can’t find a deal, but don’t tell the Horseshoe people that. View from the top of the zip line. You can just see Ryan on his way down. This entry was posted in Family, Vacations on August 5, 2013 by Graeme.